I received this adorable handmade Christmas Card from Marilyn at Delights of the Heart. 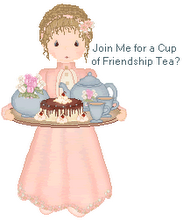 Marilyn and I have been online tea friends for several years. She began blogging a few months ago. The little angel charm is tied to the top of the tree. On the back it says "made for an angel." So cute! The card is so creative and would be easy to make. Marilyn used white card stock for the card and stitched two cut out green paper Christmas trees to the card. The stitching runs from the top to the bottom of the card. It came flat in the mail and I folded the top tree to make it 3-D. Thank you, Marilyn! Just this week I read that angels are the # 1 Christmas tree toppers! So cute, Linda. Have you been to my blog recently? Your card's twin is there! I love home made cards, they say so much more then Merry Christmas. Thanks for the nice comments on my card. I had a great time making them this year. I use to make them every year, then life got busy and I didn't do it anymore. This year I was determined I would make them again.